New Delhi, Dec 23 : Diego Maradona received a lot of flak as Argentina struggled to qualify for the World Cup, but his most prominent striker Lionel Messi feels the legend gives a lot of confidence to his players. "I think he is a manager who is very close to his players, he is like one of us and he gives a lot of confidence to all his players," Messi, who was crowned the FIFA World Player, said in an interview. The 22-year-old Messi, who is the first Argentine to win the FIFA award, has always been compared with Maradona, especially after his excellent goal for Barcelona against Getafe in the Spanish Primera Liga. Messi, however, doesn't like to be compared with Maradona. 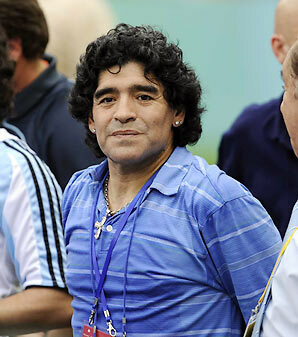 "I feel flattered but, as I have always said, there is only one Maradona, there is not going to be another one like him. I try to keep on growing, to keep on learning, but I know I am far away from that. I play my career without thinking of any comparisons with Diego." Asked about his expectations from the World Cup, Messi said: "The truth is that I know very little about South Africa, practically nothing. And I hope it is a great World Cup for us. I think we are getting ready in the best possible way. I think Argentina has many good players who are very eager, they are very illusioned about getting as far as possible." On the different styles of play with Barcelona and Argentina, Messi said: "We play very differently. At Bar? a, we have been working for a long time, we do a type of football which you rarely see anywhere else. We have known each other for a long time, we train together every day. With the national team, we are building a team together, we are searching for our way of playing, we are searching for a team and we don't have something solid like at Bar? a, where we work at every day." Messi also said that winning the FIFA World Player award was special for him. "It's something special. I have said before that for me the most important thing is to win at group level, at team level. But to be able to receive this recognition, such an important prize, after being very close for two years, to be able to win it at the third opportunity is very important for me," he said.